In addition to providing quality chiropractic care for our patients, we also provide education on proper ergonomics. If we are going to help correct functional and structural problems in our patients' bodies, we want to make sure that our patients are not sabotaging their health as they go about their daily routines. Whatever you do with your body, especially if it is for an extended period of time, can have an effect on your structure. If you have poor ergonomics, you will be reinforcing a poor structure. If you have good ergonomics, you will be reinforcing a proper structure. Since we know that the structure of the body dictates the function of the body, we want to make sure you are doing things to help improve and/or maintain proper spinal structure. One part of many peoples' daily routine is the use of a computer. Please compare the picture below to your own computer workstation. 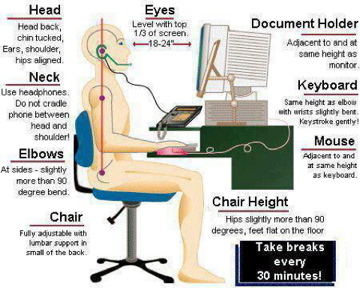 Are there areas where you can improve the ergonomics of your workstation? If so, please make the necessary changes--your body will thank you for it. And, if you have a question specific to a proper computer workstation setup or any other ergonomic issues, please feel free to ask Dr. Chiara or Dr. Findura. We'd be glad to help!